We have Mrs. Geotripper to thank for today's picture. 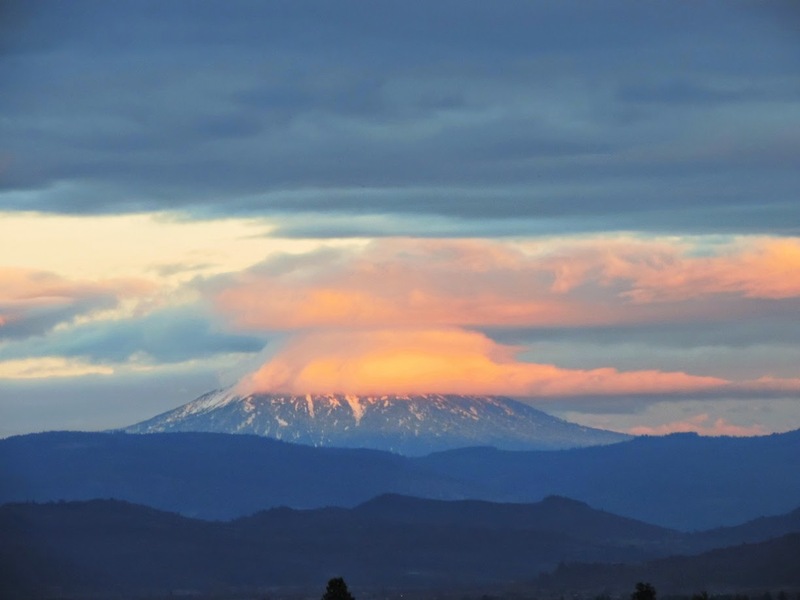 We've been on the road in Oregon and as we came over the hill into Medford at sunset, we were greeted with the extraordinary sight of a lenticular cloud settling over Mt. McLoughlin in the southern Cascades Range. I have to give Mrs. Geotripper some credit for managing several nice shots through the windshield of a car speeding along Interstate 5. Mt. McLoughlin is 9,495 feet (2894 meters) in elevation and can best be described as a composite cone, as it is in part a basaltic shield with a prominent summit cinder cone and andesite flows. It has not erupted in the last 25,000 years and thus appears to be low on the list of recognized hazardous volcanoes. On clear days from some angles McLoughlin is a deceptively symmetrical cone. The summit has been deeply carved by glaciation. Lenticular clouds will form when moist air is pushed over obstructions (such as, say, volcanoes) and the temperature reaches the dew point, forcing the water vapor to condense into clouds. As the air stream drops on the leeward side, the water droplets in the cloud evaporate again, forming the lens-like shape. The clouds have such a distinctive and unusual shape that they are seen as unnatural features (i.e. UFOs).